No sooner had the virtual ink dried on last week’s Friendsgiving post than I was invited to a a festive holiday gathering this past weekend. The potluck theme? Asian Friendsgiving. And what veggie side does one bring to said table? 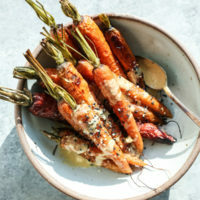 Why these Sesame Ginger Whole Roasted Carrots of course! 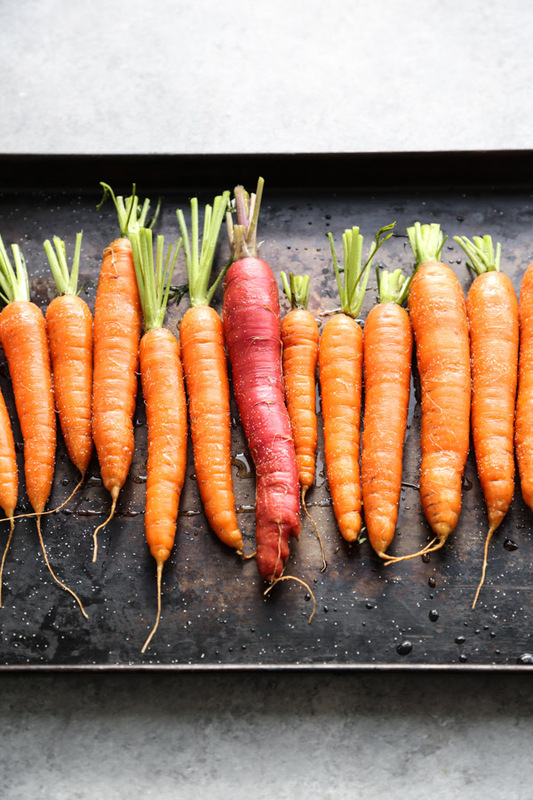 I first ate these carrots at a brunch hosted by Michelle Tam of Nom Nom Paleo. 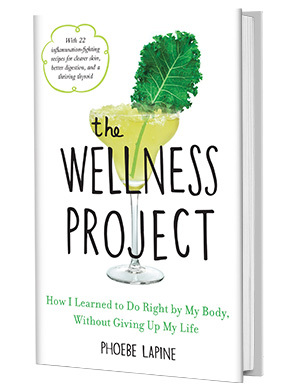 If you’re not familiar with her work, well…maybe you should start reading the NY Times bestseller list like I do! Her last book was a regular on it, and her new addition to the Nom Nom fam, Ready or Not!, is no different. This book has all of Michelle’s usual healthy spins on Asian comfort food, but is organized brilliantly by speed and prep strategy. In other words, are you making this in advance? Do you have a little extra time to cook dinner the night of? Or are you super not ready and need something lightning fast to get on the table. A woman after my own heart, she has a whole chapter dedicated to sauces, which is where this addictive ginger sesame dressing hails from. Most Japanese restaurants make one of two dressings. Either this thick orange carrot number, or a lighter vinaigrette seasoned with sesame. This is the best version I’ve found to date that recreates the latter with no cheap oils or table sugar. I learned so many things watching Michelle demo this dressing in person, which is usually not the case for a demo that involves just throwing things in a blender. 1) She is a goddamn delight. 2) Keep fresh ginger in the freezer and use a microplane to add fresh ginger snow to your recipes. It melts right into your food and saves you many a moldy shrively knob. Total No Waste Month win! And… 3) If you don’t have whole sesame seeds on hand, use tahini! This one seems so obvious, but I often forget to get creative with tahini in Asian-themed recipes. It feels like such a Mediterranean/Middle Eastern ingredient, but of course pairs so well with anything flavored with toasted sesame oil. After all, it’s just ground sesame paste! 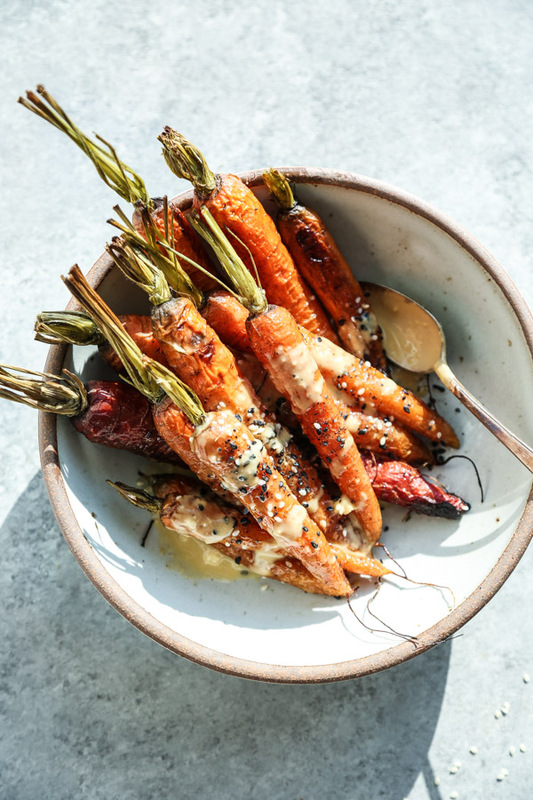 If you’re looking for a last minute side dish for your Thanksgiving table, this whole roasted carrots recipe fits the bill, even if you’re not serving Peking Turkey as the main. The ginger and sesame goes surprisingly well with other holiday flavors. And the best part is that it can be made completely in advance and enjoyed at room temperature. Because on Thanksgiving we want to be READY. 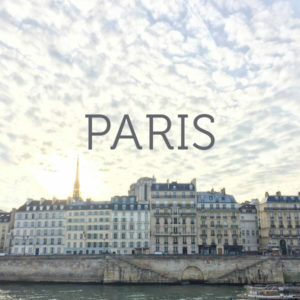 Read on for Michelle’s recipe and hop over to the FMP archives here for more last minute Thanksgiving suggestions. 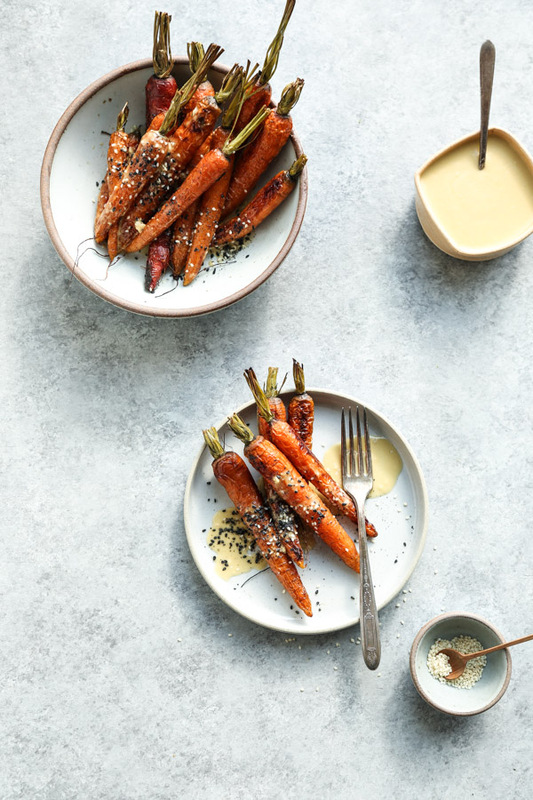 This sesame-ginger roasted carrot dish, adapted from Michelle Tam's Ready or Not!, tastes great straight from the fridge or at room temperature, making it a great option for your Thanksgiving buffet AND more importantly, T-Day leftovers. Preheat the oven to 425 degrees F with the rack in the middle position. 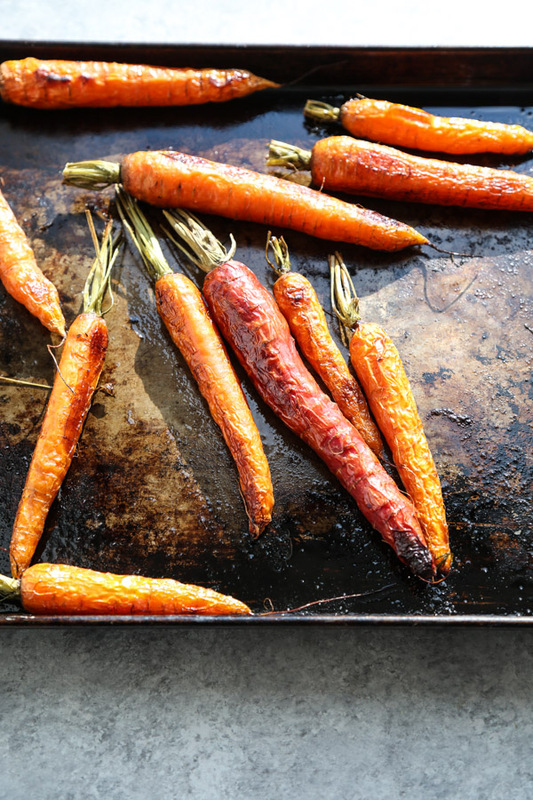 Place your carrots in a single layer on a parchment-lined baking sheet. 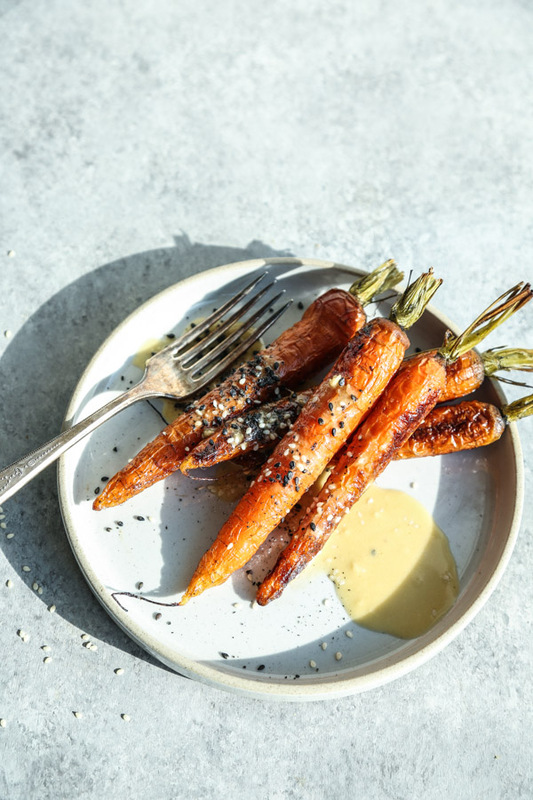 Drizzle the olive oil on the carrots and sprinkle the salt on them. Roast in the oven for 30 minutes or until the carrots are tender. 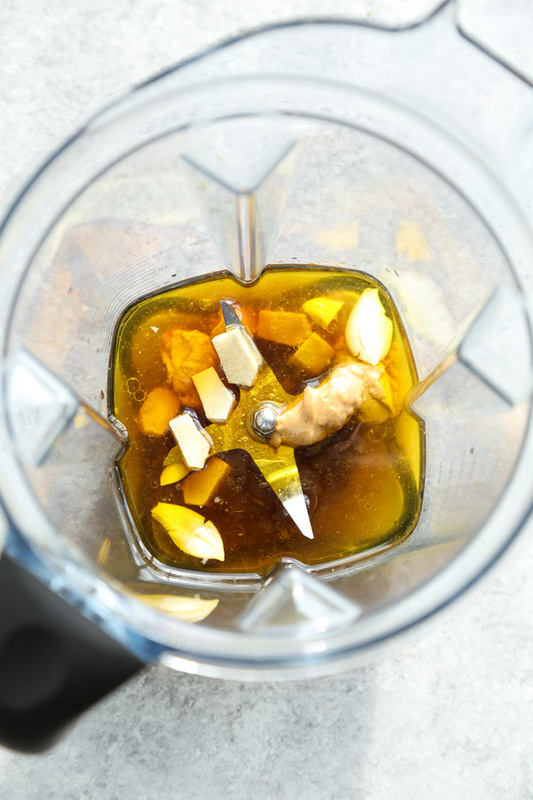 Meanwhile, make the sauce: combine all the ingredients in a small food processor or blender and puree until smooth. Taste for seasoning and add more salt as necessary. 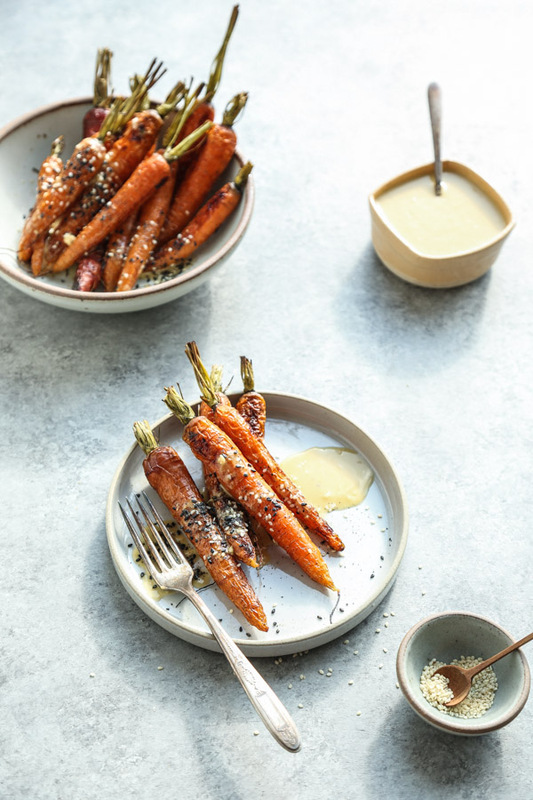 Spoon the ginger-sesame sauce over the carrots and top with the sesame seeds.